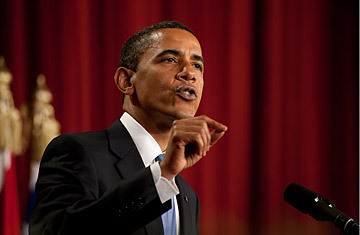 President Barack Obama speaks at Cairo University in Cairo, Thursday, June 4, 2009. On June 4, 2009, Barack Obama brought the vast promise of his young presidency to a stage at Cairo's Al-Azhar University for a much-heralded address to the Muslim world. In stirring language , Obama vowed "to seek a new beginning between the United States and Muslims around the world." But as some commentators noted  and I noticed myself, sitting in that grand auditorium  Obama's Egyptian audience offered a surprisingly muted reaction to his speech, responding mostly with polite but quiet applause. Perhaps it was a cultural thing. Or maybe it was an omen. One year later, Obama has made precious little progress toward his goal of improving America's standing in the Muslim world. A new Gallup survey of several Muslim-majority nations finds that in Lebanon, Iraq, Algeria, Egypt and the Palestinian territories, America still has a dismally low standing, one that ranges from approval in the mid-teens (among Palestinians) to 30% (in Algeria). (The lone happy exception among those surveyed is strategically inconsequential Mauritania.) Worse, after rising in mid-2009, perhaps on the early excitement around Obama's arrival and George W. Bush's departure, all those numbers have dropped again to roughly Bush-era levels. And in other crucial Muslim-majority nations not polled by Gallup, such as Turkey and Pakistan, there's scant evidence that America is held in much higher regard. Meanwhile, the fire of radical Islamic hatred for America burns strong. That much is clear from the attempted terror attacks of Omar Farouk Abdulmutallab, Najibullah Zazi and the would-be Times Square bomber, Faisal Shahzad, as well as Army Major Nidal Hassan, whose Fort Hood shooting rampage was apparently motivated in part by radical Islamic preachings. So why has that new beginning failed to, well, begin? One answer is that Obama has failed to deliver on some key promises he made in Cairo. Obama repeated his previously stated vow to close Guantanamo by the end of 2009. But that pledge is now five months overdue and counting, with little prospect of a solution in sight. The same goes for his ambitious talk of Middle East peace. "I intend to personally pursue this outcome with all the patience that the task requires," Obama said. But it was another line that drew a rare moment of loud applause from his audience: "The United States does not accept the legitimacy of continued Israeli settlements," Obama declared. "It is time for these settlements to stop." Those words signaled a new emphasis in America's approach to the problem, and as such they infuriated Israeli leaders (while cheering Arab ones). But the Israelis quickly told Obama to, in effect, go fly a kite. And when Obama responded with little in the way of real consequences, many Arabs saw confirmation of their longstanding view that the U.S. treats Israel with kid gloves. "Particularly on Israel-Palestine issues, the primary prism through which the U.S. is judged [in the Muslim world], there is a sense that despite the high expectations generated by the speech, the Obama administration is basically more of the same," says Michael Hanna, a Middle East expert at the Century Foundation. "By raising expectations on the front end, the Administration also raised the stakes of inaction." On other points, though, Obama did lower expectations  presaging the difficulties ahead. He warned that U.S. troops would fight in Afghanistan for as long as "violent extremists in Afghanistan and now Pakistan [are] determined to kill as many Americans as they possibly can," and would order 30,000 new troops into that Muslim land a few months later. And Obama offered only the mildest nods to human rights and democracy  pressing questions in the despotic Middle East especially, but ones that his realist foreign policy have largely glossed over in the name of stability, perhaps at a strategic cost. In a recent briefing for Congress, Pew Research Center president Andrew Kohut  who has polled extensively in Muslim countries  warned that America's standing in the Muslim world won't truly improve until Muslims view the U.S. as more "fair-minded" in its peace process involvement; come to believe that American anti-terrorism efforts are not by definition anti-Muslim; and see that American forces are no longer at war in Muslim lands. None of those things are likely to happen in the very near future. Credit Obama for seeking a new beginning. But his speech in Cairo was only the slightest of starts. And it's hard to imagine a happy ending anytime soon.